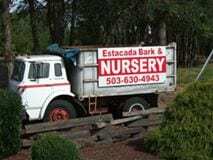 Estacada Bark & Nursery, Inc. They provide a variety of Landscape supplies such as bark mulch (hemlock and fir), top soils, compost, wood chips, sand, rock, shavings and sawdust. There is also an acre of nursery stock. Stop by and check them out!